A good social media speaker is hard to find. What I’ve observed from attending dozens of conferences is that most of them repeat the same clichés (“remember to listen”; “be human”) and almost never deliver truly practical advice. Sometimes I wish there was a way to see how much actual success each speaker has had from following his own advice. That would make it easier to filter out the self-declared gurus from the folks who truly know what they’re talking about. Scrutinize their bio. If it boils down to “I’ve self-published a book and I speak regularly,” that’s not enough. Has the person accomplished real things that have made her – or the companies she’s worked for – real money? When constructing my own bio, I always emphasize that I am an entrepreneur first and foremost, a person who has created and sold multiple successful internet companies. Without that experience, which can easily be backed up by a Google search, I wouldn’t have the necessary experience to teach an audience how to use online marketing to succeed in business. In my bio, I emphasize my practical accomplishments (underlining added for emphasis). 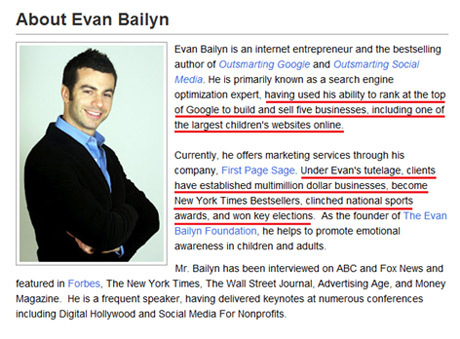 If you are considering a speaker and there is no mention of achievements connected to actual business success, be wary. Watch their video with an eye towards practicality. Every good speaker should have several videos of them speaking online. I always recommend watching these videos, but they’re especially important when looking for a social media keynote speaker. In a field so crowded with talkers rather than doers, sometimes you can glean a great speaker just by observing his style. Do you get the sense that the speaker is “getting real”? This is an unedited video of a speech I gave a few years back. I feel it shows the fact that I get practical and real with my audience, rather than getting lost in buzzwords and trends. Ask to speak to references. When considering a speaker, it can be helpful to ask for the names of one or two conference directors or heads of events who have worked with the speaker before. When you talk to these references, look past the glowing review you are sure to encounter. Ask if attendees at the last talk the speaker gave walked away with actionable knowledge. If you dig in to this subject, you may find the answer you’re looking for. You will never have a lack of social media speakers – but the best ones are the ones who can explain in clear and simple English how to get an ROI on your social media investment. Using the above tips, you should be able to line up some great speakers for your conference or event. As always, if you have any questions at all, please feel free to e-mail me. There is no charge for advice.